Are you planning to cook delicious meals at home but do not have either the faintest clue or the inspiration on where to start? If yes, then Gousto can give you a little help on your way to becoming a domestic deity. 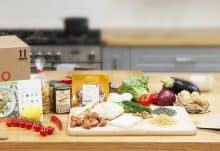 The subscription box provides you with all the delicious ingredients needed to create tasty, easy and healthy meals at home. The good thing about the ingredients you get from Gousto is that they are seasonal, fresh and organic to ensure a high quality and maximum taste. What’s more, the recipes are developed by a team of professional and passionate chefs who create all the recipes in accordance to quality and customers’ choices. If you want even more inspiration, you can also take a look on Gousto’s website, where ten delicious and healthy recipes are published every week. The selection is regularly updated so you get to choose new recipes that are best suited to the tastes of you and your family. The subscription service sends high-quality pre-portioned ingredients with recipe cards directly to your front door once a week. Just place your order, and the delivery is processed straightaway. Gousto’s effortless recipes and inspiring meal ideas guarantee that you’ll have a happy and full stomach – without the hassle of creating meal plans from scratch. With a food subscription service this convenient, there are no more excuses for ready-meals! How would you rate Gousto ?